FAQ part 1 | What Car? 1. Do electric cars drive differently to conventional vehicles? • Yes. Unlike a petrol car, full torque is available from standstill, making the latest EVs such as the Nissan Leaf, feel far nippier than their eco-credentials would suggest. • EVs are comparatively refined, with wind noise and a gentle whir from the electric motor likely to be the only intrusion. 2. How far can you travel on one charge? • The Nissan Leaf can cover between 90 to 110 miles, as can the forthcoming Volvo C30 Electric. The Golf-sized BMW i3 will have a range of 100-130 miles when it is launched in 2013. However, heavy-footed driving will drastically slash the range of all EVs. • You'll also notice the car slows down a lot quickly than a conventionally powered vehicle. This is because EVs have a regenerative braking system, which uses braking energy to recharge the battery. • Mitsubishis I-Miev, along with the near-identical Citroen C-Zero and Peugeot Ion, will all manage to cover around 90 miles. • Some smaller EVs that are intended for city use have a shorter range the Citroen C1-based ECC C1 Evie has a range of just 60 miles. • The sporty Tesla Roadster has a claimed range of up to 220 miles and a price of around 90,000. 3. Where can you charge an electric car? • There are currently just a few hundred charging points nationally, which means many owners will have to use domestic sockets. 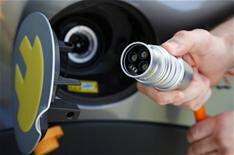 • Energy Secretary Chris Huhne announced recently that the Government plans to invest 30 million installing up to 8500 charging points across the UK by 2013. • London Mayor Boris Johnson had announced plans for 7500 EV charging points across the capital, but this has been scaled back to 1300 following the Government spending review. • A map of charging points is available at www.ev-network.org.uk. The website also has a smartphone app, allowing you to search for charging points along your route. 4. Do you need special equipment to charge an EV from home? • You can plug an electric car into a domestic 240v socket, but most manufacturers recommend a home charging point. If you plan to charge from home, it is likely that youll need off-street parking to avoid the risk of trailing wires across public pathways. • While a domestic socket can be used, the industrial standard Blue Commando connector is a weather-proof solution for outdoor charging, and able to carry a higher 16 amp current, which makes it a safer option. • For those charging at home, it's advisable to have a dedicated spur installed to supply the charging point to avoid overloading your main household circuit. • Having a fast-charge point fitted in your home will cost from around 1000. 5. How long does it take to charge an electric car? • Charging time varies depending on the car and what sort of charging point you are using. • Mitsubishis I-Miev has a charge time of around six hours, while the Nissan Leaf takes 12 hours to charge fully on a domestic socket. The Tesla Roadster takes 16 hours on a domestic 240v socket. • Rapid charging can provide about 80% of maximum charge in half an hour, although this method can shorten battery life. • Special equipment is required for rapid charging at home, so is likely to be feasible at public charging points only for the time-being. 6. What does it cost to charge an EV? • Each recharge costs approximately 2.50 to 3. If you cover an average of 10,000 miles per year, this equates to between 250 and 300 per year in electricity costs. In practice, if charging is carried out overnight on reduced rates, this cost could be less. • Using public charging points is often free, at least while the Government and local authorities are trying to incentivise the use of EVs. 7. Are there any more environmentally friendly ways of charging? • If your home has solar panels it is certainly feasible to charge an EV using the same renewable energy source. British Gas quotes a starting price of 9000 to equip a home with panels, but you can recoup some costs by selling excess energy back to the network. 8. Are EVs more expensive to buy than equivalent petrol or diesel cars? • Yes. For example, the Nissan Leaf is around 10,000 more than a conventionally fuelled alternative which still leaves a considerable deficit even after the Government's 5000 incentive is taken into account. • Some smaller electric cars, such as the Peugeot Ion, are available on lease at 415 +VAT per month however, similarly sized, conventionally powered alternatives can be leased for around 100 a month. • Renault, which will launch its Z.E. (zero emissions) range in 2012, has said it will keep prices of its electric cars at the same level as the equivalent diesel models after the 5000 Government subsidy is deducted.